Each year thousands of Americans trek around the country in their RVs and Motor homes in search of new adventure. What better way to spend a vacation with all the accommodations of home and without the worries of hotels? RV Parks are the landing place for most, providing water, sewage, electrical connections, and sometimes WiFi internet. Most WiFi internet is broadcast from the park office and has a limited range. For those who are within range of the WiFi access point life is good, but for those who are stuck out in the "Back 40", life is not "peas and carrots". To check your email or browse the internet for directions you must pack up your laptop and head down to the lobby in the main office. Of course your privacy is gone and it seems that people are always interrupting your internet secession. It's about time you figure out how to get better WiFi from the comfort of your RV. Some locations only have a few RV parks available, but if there are several parks available then try searching online for web sites that list free WiFi parks in your area. Once you find one that you like, call in and reserve a site that is closest to their WiFi access point. Some RV parks will not let you reserve sites ahead of time and in this case you will have to figure out which campsite has the strongest WiFi signal. When you arrive at the RV park ask the attendant where the WiFi access point is located. After receiving your answer, take out your WiFi enabled laptop and walk around from site to site in search of the strongest WiFi signal. Start at the sites that are closest to the WiFi access point. Usually the signal strength is represented by a number of bars next to the WiFI network name when scanning with your laptop. Be sure to press the refresh icon at each site for an updated signal strength readout. When looking for a good site, keep in mind that even one tree can block your WiFi signal. Try to achieve perfect line of sight to the outdoor WiFi antenna or RV park office from your campsite. If the RV park is crowded then it is ok to choose a campsite further back as long as it has good line of sight to the access point and good signal strength. These two should relate directly to each other. Once you find a site that has good WiFI signal strength, write down the campsite number and request it for your stay. So, you've finished setting up camp and now your ready to get connected to the WiFi Internet. At first, try connecting using just the WiFi capabilities that are built into your laptop or wireless device. If you are unable to get a good connection from inside the RV or motor home then try positioning the laptop in a window that faces the RV Parks WiFi Access Point. The walls of an RV can block your WiFi signal completely, this is why we recommend using the window as a portal for WiFi. Unfortunately holding your laptop up in the window is not a greatly comfortable position. This can wear onyour arms after only a few minutes. If you are experiencing this then your solution is a USB WiFi Antenna (like this one) for a Windows based laptop. A USB WiFI Antenna should be more powerful then your average laptops built-in WiFi abilities but in some cases newer laptops do have very powerful antennas. Place the USB antenna in the window with suction cups or double sided sticky tape and run the USB cable to your computer (Windows based). If you need to share the WiFi connection with more than one laptop or non-Window based devices please check out the CC Vector RV Long Range 2.4 GHz WiFi Repeater System. USB WiFi antennas are also a great way to avoid harmful radiation. You will notice that almost every WiFi device has an FCC RF exposure warning that tells you to keep it at least 8-inches away from your body. Some people worry about the radiation that is output from their laptop could cause them health problems because of their close proximity when using it. Using a USB Antenna with a USB extension cable will lessen the possibility of exposure to harmful RF because you can place it further away. Remember to turn off the built-in WiFi on your laptop when using a USB antenna or you will remain subject to the harmful radiation. Turn of the built-in WiFi using a switch or button on your laptop. If you are still unable to pickup the WiFi signal then you may need to place your USB WiFi antenna outside. It will need to be located above the roof of your RV or motor home for best reception. Zip ties work well to secure it to a plastic or PVC pole. We don't recommend mounting it to a metal pole or object as it could block or lessen your WiFi reception. If you plan on mounting it permanently outdoors then you will need to weatherproof it. The easiest way is to use a plastic bag with some tape around the bottom to keep water out. While effective, this amature job may become an eyesore on your rig. For a more professional weatherproofing setup, try enclosing your USB WiFi Antenna in a PVC pipe with end caps. You can also use vinyl gutter pipe for better results as it has a little less resistance to WiFi signals. Here is one example of a PVC pipe enclosure. For the best WiFi antenna setup, hook up an outdoor Point-to-Point WiFi antenna on your RV or motor home's roof. This is a directional type antenna and can really bring in hard to get WiFi. It is not really a "discrete" antenna but it will get the job done. You will need to reposition it to face toward the WiFi hotspot at each campground. The trick is trying to figure out how the WiFi antenna will mount to the RV. Usually these antennas will come with mounting hardware that includes a "U-bolt" for attaching it to a pole. Once the antenna is mounted and aligned, run a low-loss LMR-400 or 9913 coax cable inside the RV or motor home to where you will be using your computer. Unfortunatly, the cable will not plug directly into your computer as your computer does not allow for this type of connection. The best solution is to use a powerful USB WiFi Adapter with the appropriate connector to adapt to the heavy cable. Since this cable is so heavy we recommend using a USB extension cable (15 foot max) to lessen the load on your computers usb port and provide extra length at the same time. You may actually have enough length using the USB cable to downgrade to smaller coax cable pigtail for short runs of about 8 feet. This pigtail cable will be specific to the connectors on the USB WiFi Adapter and the Point-to-Point antenna. Most USB WiFi adapters have a RP-SMA female type connector whereas most Point-to-Point antennas have a "N" female type connector. 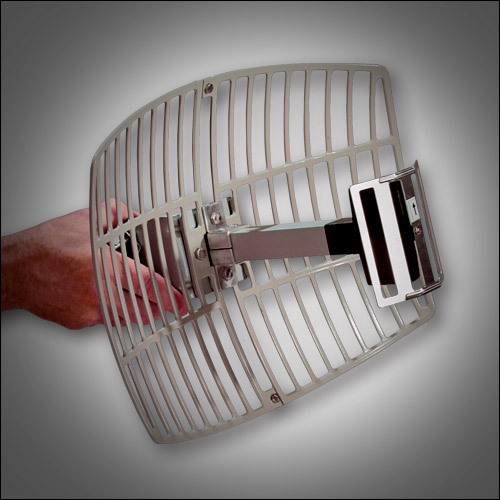 A more discrete WiFi antenna is an 8dbi omni directional antenna. You will want to use one that is rated for outdoor use and is easy to mount (like this one ). 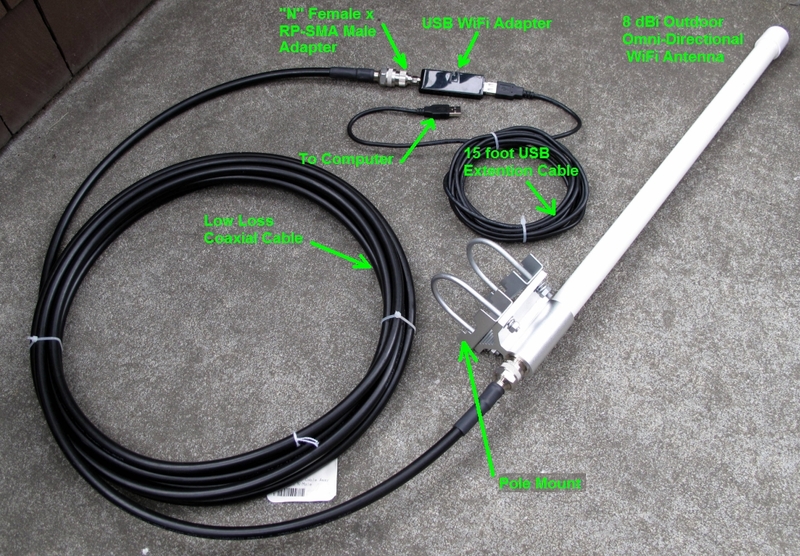 The setup will be much like the Point-to-Point antenna because both antennas typically use the same connector types. Omni-direction WiFi antennas are a little easier because you do not need to aim them at the parks WiFi hotspot. 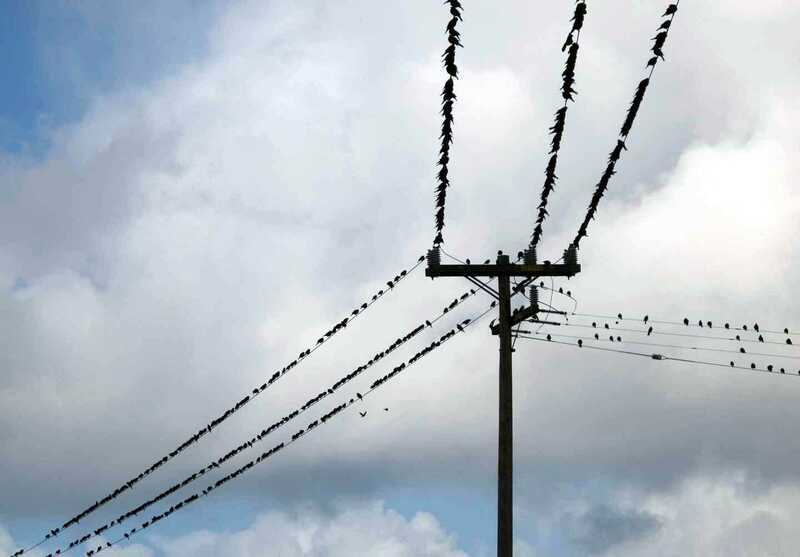 They can receive a WiFi signal from any direction. Often at an RV park you will meet people that are not able to catch the WiFi signal because they are out of range for their WiFi antenna. It is possible to share your WiFi reception with them by using a WiFi range extender to repeat your signal to others. Equipment required includes a 8dbi outdoor omni-directional WiFi antenna, low-loss coax cable, and a WiFi range extender with a removable antenna. First mount the antenna above the roof of your RV in a spot that it is not blocked in any direction by your RV. Next run the coax cable from the antenna to the WiFi Range extender that is located inside. You will need to remove the antenna that comes on the range extender so that you can hook on the coax cable. Once everything is connected up properly, plug in the power to the range extender. It will take a minute to start up. Some range extenders have a button that can be pressed to repeat the strongest non-password protected WiFi site in range (like this one ). In this case, just press the button and the range extender will do the rest. In some case where there are a lot of WiFi site the range extender will not repeat the desired site because another is stronger. In this case you will need to connect your computer to it and run the setup so that you can pick your desired WiFi site. Ideally you do not want to be too close to the main WiFi site as you may cause too much interference for it to work properly. You want to be at least 150 feet away from it but not out of range of the WiFi signal. If the parks WiFi signal is weak then you will want to be at a closer site.